We Brits love a good roast dinner – we’re famous for them the world over – but how often does your roast not quite live up to expectations? 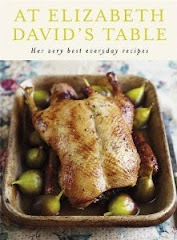 Whether you’re looking to get crackling to die for, a more succulent roast chicken, rare roast beef, potatoes which are crunchy on the outside and fluffy in the middle or simply some new ideas of what to do with fish, vegetables or even fruit, Molly Stevens has the answers. In All About Roasting you can jump straight in and cook the recipes (beware that measurements and temperatures are for a US audience but conversion tables are at the beginning of the book) or, if like us you’re serious about honing your skills, you can first read about the principles of roasting – from a definition and history to the science behind the perfect roasting techniques through to preparation, temperature, shelf positions, timing, checking if it’s cooked, resting and carving. You name it, she’s covered it! There are handy tips throughout (ever thought of lining your baking tray with greaseproof/parchment paper to stop your potatoes from sticking or salting your meat for 24 hours before cooking to ensure it’s juicy and tasty? Both work!) and some tempting photography. Though there aren’t as many photos as we’d like of finished dishes there were plenty demonstrating key skills step-by-step, such as trimming joints, butterflying and rolling or carving. You can tell from the writing that Molly is someone who has put a lot of time and dedication into this book – many a technique was thoroughly tested to ensure we were guaranteed success. 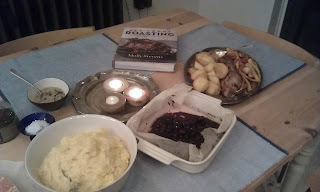 We tried, with more than satisfying results, the basic roast chicken using the pre-salting method, both the simple roasted potatoes and the British roast potatoes, a more tricky pork tenderloin roulade, butter roasted plums with vanilla, ginger and rum as well as a surprising dish of roasted cherries with creamy polenta. Full bellies all round again! Not instantly struck by the publication, we grew to appreciate it as a great reference for showing us how to turn a good roast into an exceptional roast. We’re all now well on the way to being masters in the art!